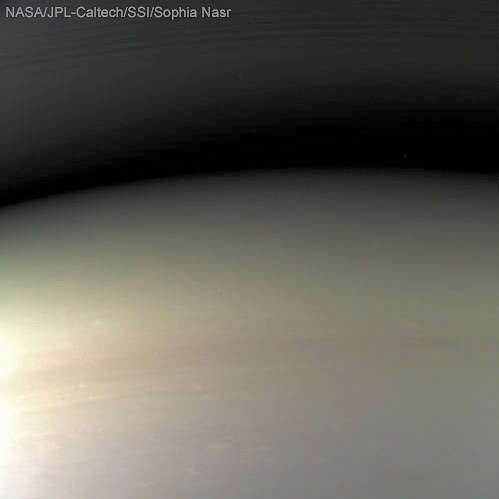 This image is the very last image of Saturn Cassini before it went to its new home inside the planet. Taken on Sept. 14, 2017, processed by me. In the wee hours of September 15, 2017, the Cassini mission, a mission of 20 years of meticulous work, and arguably one of the most inspirational and successful of all, came to an end. After five months of 22 grand finale dives between Saturn and its rings, taking the spacecraft closer and closer to the planet, it’s finally gone home and become one with Saturn. The Eye of the Storm in Saturn’s Polar Vortex. Taken by Cassini April 26, 2017, processed by me. A hauntingly beautiful crescent Saturn, with a sliver of its rings. Probably my absolute favorite image of Saturn I’ve processed. This one, taken on June 12, 2007, features the opposition effect. Caught the opposition effect right there. And I’ve written all about it, along with spokes! You can read my blog post, here. Polar hexagon, rings, and all the pretty things. Taken on June 11, 2016. That one is my only processed image that features nearly the entire planet. The bands, the polar hexagon, the rings, it’s perfect. And the fact that you can see the finest of rings makes this image so delicately beautiful. Spiral density waves in Saturn’s A-ring. Taken July 6, 2017. I was delighted with how this image turned out, because, well, RINGS, and the color looks just right. It remains one of my favorite images I’ve processed to date. I wrote a post all about Saturn’s rings, which you can check out here! One of Cassini’s final images of Saturn, taken Sept 13, 2017. The detail in them is just spectacular. I’m glad this was one of our last views of Saturn through the eyes of Cassini. Another can be found in my photo gallery, here. Needless to say, this mission has grown very close to my heart. Not only have I processed images, but I’ve written multiple blog posts on various aspects of the planet, reveling in the physics of its phenomena. I’ve participated in a lot of social media outreach on Saturn using Cassini’s eyes to explain to my Twitter followers what they’re seeing, and why. I have several moments on Twitter: why Saturn’s polar vortex is blue, Daphnis making waves in the Keeler Gap, Saturn’s rings and F-ring, and the Keeler Gap, Encke Gap, and Propellers. I’ve grown really attached to this mission, so saying goodbye was difficult. On September 11, 2017, at 12:04 PM PDT, Titan gave Cassini a gravitational nudge that set the spacecraft on a trajectory that would send it to its final destination: inside Saturn. A crescent Titan with a thick blue haze. Taken by Cassini Sept 1, 2017. The reason the Cassini mission needed to end is because the spacecraft was running out of fuel, so there would come a point where the team would no longer be able to make orbital adjustments to the spacecraft. It would effectively be a giant hunk of potentially contaminating material, orbiting Saturn completely under the gravity of the Saturnian system. That leaves a slight possibility that Cassini could one day crash into moons that are potentially habitable, and contaminate them: Enceladus, and Titan. Enceladus, taken by Cassini on Aug 1, 2017. Enceladus, a moon continually spurting ice plumes into space, ice plumes found to contain molecular hydrogen, an ingredient for life. This discovery was phenomenal! All the more reason to protect this moon, right? Well don’t be too quick to turn your back on Titan, it’s got lakes, and although of methane rather than water, it could host different life forms. It’s the only planetary object in the solar system other than Earth to have liquid flowing on its surface. And it’s got some really interesting chemistry! So scientists wanted to make sure not to mess with the ingredients on these moons. Fitting, then, that Titan gave Cassini that gravitational assist, isn’t it? I am delighted to have been given the opportunity to join the NASA Social for the Cassini Grand Finale at NASA JPL, to hear directly from scientists on the mission, to feel what they felt, to share the moment with them and with fellow Cassini fans. It was surreal. My friends and I hugged after loss of signal was confirmed. Some fought back tears. This was a tough goodbye for everyone. You can check out my Twitter thread where I live tweeted the talks at the event, from the visit the day before, through loss of signal, till the final briefing after mission’s end. Cassini went where no spacecraft has gone before, 22 times, and then again, when it dove into Saturn, its new home. It’s revealed Saturn to be this system that’s far more complex than we had imagined, uncovered a plethora of wonders we’d otherwise have never known. Cassini will undoubtedly usher in a new wave of planetary exploration. Missions to moons like Titan and Enceladus are already being discussed (this has been confirmed by the scientists on the mission). And just maybe, Cassini will be the reason we finally explore two other giants, lurking in the outer solar system, only to have been visited once by the flyby of Voyager 2: Uranus and Neptune. Cassini is a brave spacecraft. It did science right to the very last second. It fought to keep its antenna pointed toward Earth. In fact, it fought so hard that it ended up lasting 30 seconds longer than scientists on the mission anticipated. Who knows what lies within the secrets Cassini whispered back to Earth during its final moments? We’ll soon find out. Cassini, whenever I look at Saturn, I will remember that you are one with Saturn, and Saturn is with you, and I’ll know you’re in there, somewhere. I’m sure everyone else will, too. Farewell, Cassini. PreviousThe Milky Way IS Teeming with Black Holes, but there’s MORE!